Not everyday that you come across an infographic from 1878. The above diagram is projected from a series of electro-photographs, executed by instruction of Governor Stanford, and illustrates the course traversed by the feet of the mare Sallie Gardner during a single complete stride. The mare being thoroughbred, one of the fastest runners on the coast and noted for her graceful form and superb gait, the successive positions assumed by her during the stride may be accepted as representative in their character. During certain portions of the stride the of the mare were moving with a velocity equivalent to more than 100 lineal feet in a second of time, or nearby three-fourths of an inch during an exposure of the two-thousandth part of a second. To enhance the usefulness of the photographs, the indistinctness of their outline resulting from the rapid motion has been corrected with care and preserved their actual positions. Photographs from the original untouched negatives are curious for comparisons and can be obtained at the same rate if required. Hereafter the exposures will be reduced to the five-thousandth part of a second, thus limiting any movement to one-fourth of an inch. In future experiments it will be interesting to observe to what extent knowledge of the foot movement of a colt, as illustrated by electro-photography can be availed up to determine is probable speed at a more advanced age. In 1872, former Governor of California Leland Stanford, a businessman and race-horse owner, had taken a position on a popularly-debated question of the day: whether all four of a horse’s hooves are off the ground at the same time during the trot. Up until this time, most paintings of horses at full gallop showed the front legs extended forward and the hind legs extended to the rear. Stanford sided with this assertion, called “unsupported transit”, and took it upon himself to prove it scientifically. Stanford sought out Muybridge and hired him to settle the question. In later studies Muybridge used a series of large cameras that used glass plates placed in a line, each one being triggered by a thread as the horse passed. Later a clockwork device was used. The images were copied in the form of silhouettes onto a disc and viewed in a machine called a Zoopraxiscope. This in fact became an intermediate stage towards motion pictures or cinematography. In 1877, Muybridge settled Stanford’s question with a single photographic negative showing Stanford’s Standardbred trotting horse Occident airborne at the trot. This negative was lost, but it survives through woodcuts made at the time. 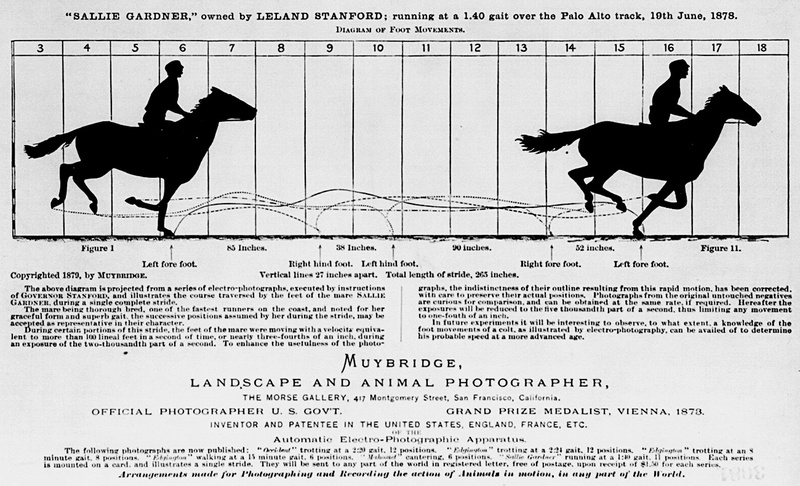 By 1878, spurred on by Stanford to expand the experiment, Muybridge had successfully photographed a horse in fast motion.